GPE's financing and funding framework embeds support for civil society into GPE's operational model through the new Advocacy and Social Accountability funding mechanism. 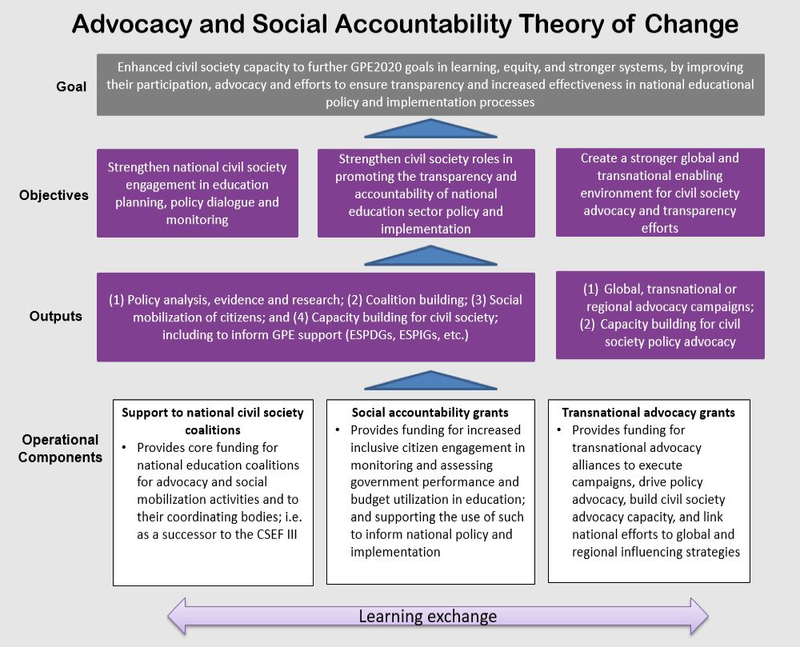 The goal of ASA is enhanced civil society capacity to further GPE 2020 goals in learning, equity and stronger systems, by improving their participation, advocacy and efforts to ensure transparency and increased effectiveness in national educational policy and implementation processes. to create a stronger global, regional and transnational enabling environment for civil society advocacy and transparency efforts in education. The ASA mechanism will invest in local, national and transnational civil society groups working to improve accountability for the right to education in partner countries. ASA will allocate up to US$55.5 million to support civil society organizations such as NGOs, parental, community-based, and teacher organizations in their advocacy and social accountability efforts. This will strengthen the engagement of national civil society coalitions in education planning, policy dialogue and monitoring, by supporting their core functions of greater coordination and collaboration across civil society in national policy setting and monitoring. This will also fund advisory support to program planning and implementation of the Global Campaign for Education Global Secretariat and Regional Secretariats, as well as the regional and global advocacy of the GCE. This component aims to strengthen civil society roles in promoting the transparency and accountability of national education sector policy and implementation. Social accountability grants will provide funding for activities such as: improving the transparency, participation, and accountability of sector policy dialogue; increasing the availability, sources and variety of information to formulate and act on relevant policy solutions; mobilizing citizens as right holders to monitor implementation of education policies and finance and use this information to hold duty bearers at all levels accountable. This component will provide grants for activities that create stronger global and transnational enabling environment for national civil society advocacy and accountability efforts. This will include funding for: joint advocacy to influence transnational education policy agendas; joint campaign initiatives; linking national efforts and evidence to global and regional influencing strategies and development of transnational learning capacities. ASA’s focus on adaptive and learning-oriented practices distinguishes it from other forms of funding. The goal is to support institutionally healthy, sustainable, and creative civic organizations able to effectively advocate for the public interest in education. ASA emphasizes learning across and among grantees, ensuring they have enough time for preparation, context analysis and skills building before beginning full scale program implementation. The aim is to equip grantees to better respond to the policy environment, innovate and experiment and distill their key learning so it can inform their next steps, and provide good practice for others. ASA will provide an initial period for intensive capacity support – called “year zero” – for the development of sound theories of change, monitoring, evaluation and learning strategies, and capacity building in core areas for grantees. ASA will work with learning partners who are expert organizations or institutions that will support ASA grantees in year zero through capacity development, mentoring or facilitation of grantees peer to peer exchanges. Learning partners will be matched with grantees to ensure mentoring, facilitation and training. These elements of the ASA design will link with the Knowledge and Innovation Exchange (KIX) mechanism by feeding into and drawing from learning networks at global, regional and country levels. In 2017, the GPE Board approved the broad architecture and theory of change of the ASA mechanism. It was based on extensive consultations with all GPE constituencies and other experts from the sector to inform ASA design, and lessons learned from its investments in the Civil Society Education Fund. Throughout 2018, the Secretariat worked with the Strategy and Impact Committee, as well as a group of technical experts in civil society funding, to develop the operational components of the mechanism. In September 2018, the Strategy and Impact Committee approved the blueprint for ASA and selected Oxfam IBIS as grant agent, based on the results of a call for expressions of interest from organizations with relevant grant management experience. Oxfam IBIS was then invited to develop a full proposal for the operationalization of ASA, based on the blueprint and informed by the deep experience Oxfam has working with civil society in GPE partner countries. In early 2019, the Strategy and Impact Committee and the Board of Directors will consider the final operational plan for ASA, with the aim of approving the launch of the ASA mechanism by Oxfam IBIS in the second half of the year. Oxfam IBIS will subsequently launch calls for proposal for work to be carried out in each of ASA’s three components.